Telecom operators in emerging markets face the challenge of continuously optimizing their commercial architecture to stay economically healthy. Playing in highly competitive markets can lead to overspending to maintain acquisition activity. Aligning commercial spend with acquired value is key to standing out in the market. It is not news that revenues per user (ARPU) have been dropping for years in the telecom industry. This has been driven mostly by services commoditization, as well as fierce competition from operators, and this effect is particularly stronger when a new operator enters the market. Players are struggling to keep their margins healthy by maintaining efficient operations. Commercial costs can account for up to 30 percent of the service revenue, which impacts EBITDA margins directly. We see a significant opportunity in optimizing this expense. Mobile operators must acquire a large number of grossadditions annually to maintain and grow their customer base. This volume can be substantial, especially across emerging markets; we have seen markets where operators reach annual gross-additions that surpass their customer base size. These kinds of markets usually have high proportions of lowpurchasing-power customers that are willing to trade their loyalty for better deals, and operators get involved in continuous price wars. 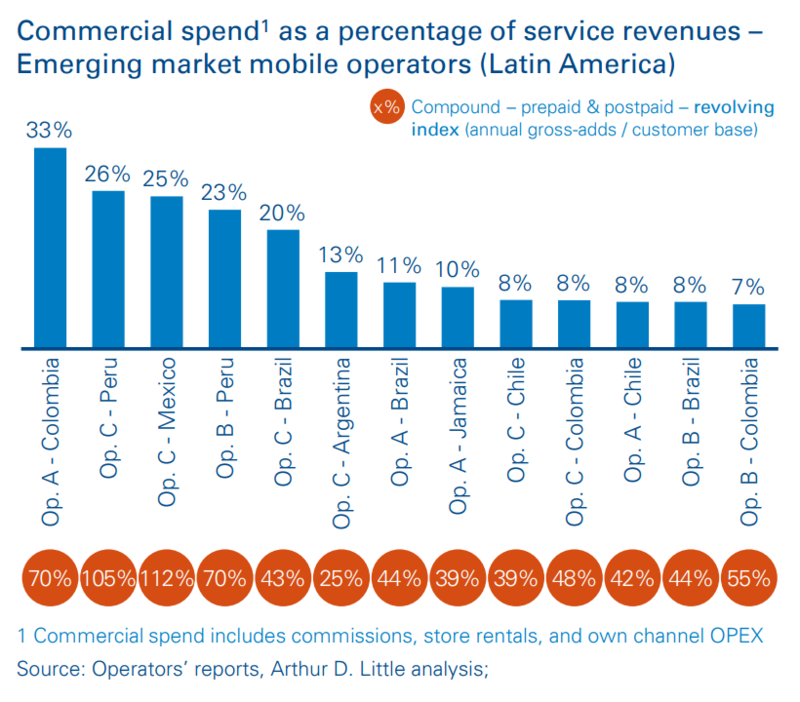 To further explore this phenomenon, we performed an extensive benchmarking exercise focused on mobile operators from emerging markets (in Latin America). We studied 29 operators, and found that it is possible to reach annual acquisition volumes as high as 150 percent of the customer base – and, on average, mobile players must acquire approximately 55 percent of their customer base annually. This effect ultimately implies that the operator must pay over one sale commission per active customer annually just to maintain its market position. Such high commercial spend ends up representing a significant proportion of service revenues. What drives divergence in commercial expenses among operators? Nevertheless, we found competitors with similar conditions to those mentioned above and completely different commercial spend. What internal factors are influencing such divergence in operators? To drive more efficient commercial spend, the challenge lies in altering sales-channel architecture without sacrificing acquisition value and volumes. Sales-channel architecture encompasses how and to whom operators sell, the channels they use, and their footprint. Operators in emerging markets face the challenge of continuously optimizing their physical commercial architecture to stay economically healthy. Highly developed markets have found digital channels as a way to lower acquisition costs, but the prerequisite conditions in emerging markets are still green, such as broadband and banking penetration. As a result, operators are forced to operate in hybrid (physical-digital) sales-channel environments before digital sales can scale. From our experience working with several leading mobile players in emerging markets across the world, we have identified five key principles to design and manage sales-channel architectures that drive efficient commercial spend without sacrificing acquisition volumes or quality. Operators with efficient commercial spend take a deep, value-driven approach to the design and management of their sales-channel architecture. Aligning global corporate-strategy and sales-strategy objectives is the first step: this includes regional priorities, product (prepaid versus postpaid), brand positioning and so on. It is usual to create a thorough vision of sales performance via unitary acquisition costs, identification of key performance drivers, payback periods, and customer lifetime value created per channel. 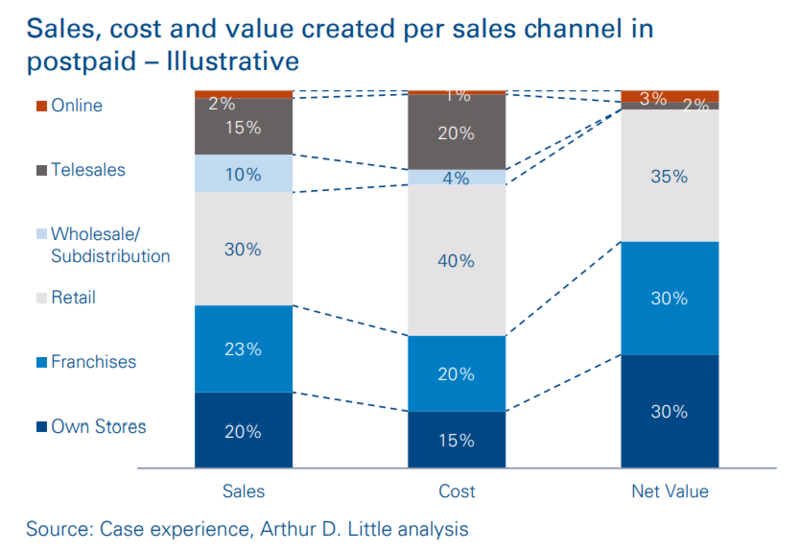 This understanding enables a clear vision of the factors driving commercial costs and whether these commercial costs are aligned with the sales volume, quality and value each channel creates. With this vision it is possible to define optimal sales-channel architecture via granular simulations of different acquisition mixes. It also helps break notions that are preoccupied with volumes and shifts focus towards profitability. After this vision has been created, it is not unusual to find out that some channels are driving an important quota of the commercial spend, but not driving much net acquisition value to the operator. On top of that, management is often unknowingly pushing growth from these channels. Efficient sales-channel architecture is underpinned by sales channels that clearly target specific customer segments. Success comes from creating a flexible and integrated channel mix, and introducing and developing sales channels that specialize in addressing specific types of customers based on their spend, purchasing preferences and consumption patterns. Once channels specialize in the segments they target, it is easier to avoid the temptation, driven by pressure to meet aggressive gross-add targets, of pushing channels to target segments outside of their areas of expertise. Examples include using traditionally high-value sales channels to also target lowvalue customers, and vice versa. Focus is key – this involves playing to your strengths and enabling development of deeper customer knowledge and expertise that drive a virtuous cycle of specialization, acquisition value and efficiency. Operators’ own stores are usually one of their most expensive assets, but they drive the highest-quality acquisitions. Own stores are also brand pillars, located in premium real estate establishments across large cities. It is vital to acknowledge the value (and fixed-cost nature) of the own-store network and decisively take action to monetize these assets. It is not unusual to become too relaxed on objective and continuous monitoring of store activity over time. When this happens, own stores tend to lose focus and stop taking a proactive approach to postpaid sales and respond reactively to prepaid sales. However, it is important to carefully monitor non-value-creating activities, with the aim of moving low salespotential customer interactions to lower-cost channels (and, when possible, digital ones). Then, when low- or zero-value activities occur, agents must be trained and motivated to convert such invested time and effort into revenues. Own stores must not drown in customer service: customer experience at stores should be focused; agents must spend most of their time in value-driving activities, either serving highvalue customers or driving new, high-value sales. This sort of initiative frees up capacity in own stores, enabling migration of quality sales volumes from other, high cost channels to own stores and reducing overall commercial spend. In a recent ADL engagement, adjusting store formats and layouts, agent skills, and scope of agents’ tasks maximized agent utilization and limited activities to only high-value ones. As acquisition productivity grew in its own stores, the operator used this as a lever to renegotiate pricing with retail saleschannel partners. The renegotiation enabled the operator to reduce commercial spend while maintaining acquisition volumes. Seasoned sales-channel teams hold numerous paradigms as unassailable truths, but several of these paradigms are more the consequences of inertia and “the way things are done around here” than fact-based observations. It is imperative to continuously challenge seemingly established sales paradigms, proving and disproving hypotheses to reach breakthrough insight that helps drive sales performance. For instance, sales management teams tend to rely on the telesales channel as a tool not only to react to sales targets, but also to take a broader approach to proactively renewing postpaid customers and migrating high-value prepaid customers to postpaid. However, when taking a deeper view of telesales performance, it is possible to find that these proactive actions have triggered unnecessary customer “awakenings”, which have caused them to seek better deals elsewhere – or even among the operator’s portfolio. This “down-selling” within the operator’s portfolio can result in churn flares and ARPU dilution. In such cases it is useful to pilot new telesales approaches, moderating proactive actions and only reaching out to customers when several key behaviors are detected. In the end, this leads to a decreased number of outgoing calls, lower telesales costs and reduced churn. Home delivery – A customer can place an order for a new SIM, in the comfort of their home, via a call center, site or app, and the SIM is delivered by an agent within hours. Street vans/Pop-up stores cater to remote locations and areas/events with occasional high traffic, where permanent stores would not be profitable. In our experience working with multiple mobile operators, following and perpetuating these five key principles to design and manage sales-channel architectures has helped reduce commercial spend as a percentage of service revenues by 3 to 6 percentage points, while increasing acquisition value by 10 to 15 percent. Customer value management initiatives to stimulate, retain and win back customers are complementary to these five principles and further enhance operator KPIs. Maintaining a lean, efficient operation is key to success in decreasing-ARPU markets. Market revolving can lead to the need to acquire up to 1.5 times the operator customer base annually. Intense commercial activity can increase commercial costs by up to 30 percent of service revenues. We have identified five key principles to minimize commercial expense while driving up acquired value.